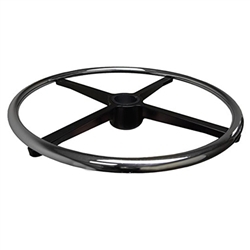 Adjustable 20" diameter cast aluminum chrome polished foot ring for improved circulation on taller stools and chairs. Can be added to any of these Perch models measuring 20-27 inches or higher (LBLN ,LBLNC, MLTK, MLTKC, ECRV, EGIN, EGINC, GYRO, LBHB, LBHBC, STEL, STELC, STPA, STPAC, WLTR, and WLTRC). Compatible with most seating brands.